Where fans of the Aloha State eat. I saved Aloha Eats in LP for my final post of 2008. Were goin out with a bang and ringing in the new year with a keeper! Lincoln Park is not great but by no means the worst (see: Bucktown) when it comes to good eat neighborhoods. This is for several reasons and one of them is its the home to Aloha Eats, Chicago's only real Hawaiian lunch place. I've never been to Hawaii but it's only a matter of time. It was a few years back when Aloha opened that I realized how much I love Hawaiian food. Its not all fresh fish and sushi (which I also love) and spam on the islands. Aloha Eats does a great job repping this food culture here in Chicago. Its a place I go to in huge bunches, sometimes I'll eat here a few times in a week then not go for a couple weeks then go again and so on. When I say lunch up above I mean what the locals eat in Hawaii which is plate lunch. Its the signature Hawaiian food item and it consists of two scoops of white rice, a scoop of Hawaiian macaroni salad, cabbage and whatever your meats are, which there will be plenty of. Popular items include teriyaki chicken/beef, katsu chicken, Hawaiian BBQ chicken, beef short ribs, spam, Kahlua pork and many more. Including the almighty loco moco (more on this below). We are talking massive amounts of food here. Its no wonder the Samoans are so big and freakishly athletic and the hottest talent bed in college football these days. Hawaiian food is a classic fusion of Japanese/Chinese/Filipino/Portuguese/American and many more with local ingredients popular and native to the state added in. I always wanted to go to Hawaii but this site here will have gotten me to go. As I have become in love with Hawaiian food I've done alot of websearch and found this sick food site. That there is one of my favorites. Now onto the food at Aloha Eats. I think with the fact that the president is Hawaiian and he vacations there that the food has gotten even more popular on the mainland since his inauguration. As you can see HERE, Aloha has an open invitation to President Obama next time hes in his hometown. When it comes to a fusion of cuisines, well Hawaii is all over the place and its comes out so very good. The most well known food item in Hawaiian cuisine is the loco moco. The website "Whats cooking America" does a great job with regional treats and the history of them. So I will quote them below on its description on the loco moco, which is a favorite of mine. You can get a taste of Hawaii's signature food item at Aloha Eats. Also right below is a picture of Aloha's loco moco, the only one in Chicago. ^"The loco moco is Hawaii's original homemade fast food and can be found at just about any fast food joint, roadside diner, mom and pop restaurant or lunch wagon in the Islands. It is truly unique to Hawaii, and it is a comfort food, or "local grind," of the Hawaiian Islands. Local food is not the cuisine that is served in upscale hotels and restaurants of Hawaii. It's basic structure was established soon after World War II - the best fast food or mixture of cuisines from many Pacific rim countries, with a special Hawaiian twist. Loco Moco is a mountainous meal consisting of a heap of white rice topped with a hamburger patty (2) and a Sunnyside-up egg (2), and then smothered in gravy. This dish is popular for breakfast, lunch, or dinner and is a candidate for the Cholesterol Hall of Fame. As you eat, break the egg - then blend the burger, egg, rice, and gravy on your fork for each bite for a real taste of paradise. There are many people who claim to have invented Loco Moco, but it is generally agreed that around 1949, either the Cafe 100 or the Lincoln Grill (both in Hilo, Hawaii) originated the first dish of Loco Moco. According to the story, the dish was created for teenagers who wanted something different from typical American sandwiches and less time-consuming than Asian food to eat for breakfast. The nickname of the first boy to eat this concoction was Loco ("crazy" in Portuguese and Hawaiian pidgin). Moco rhymed with loco and sounded great, so Loco Moco became the name of the dish." From: What's Cooking America. Good stuff, great description and I couldn't of said it any better. Aloha Eats also has a pretty good fish sandwich that I order when the hankering for one comes. Since I ate fillet o' fish from McDonalds when I was a kid, I sometimes get the taste for a fishwich similar to it. While Aloha's is similar in that its a fried fish patty with cheese and tartar that's about where the similarities end. Its a mahi-mahi fried patty and rings in at a little over $3 with cheese. I'm a big fan and its the best fishwich in town. Just another reason I love Aloha Eats is there above average burgers. Nothing too big here so they aren't really a meal in itself. They do up a fresh hand made patty a little larger than the fast food joints and put lettuce, tomato and onion on top with whatever else you want. Nothing special ingredient wise but the use of fresh meat and a price-tag of around $3 makes this a good well tasting burger in the area. But then then there's the LocoT. Its a burger I had them do up at my requests one day when the thought of it seemed great. I wanted a loco moco burger. So I asked the sweet lady working to make me a cheeseburger with a fried egg and gravy as the toppings. Introducing the LocoT. Its not on the menu but they'll happily make one if you tell them what to do. There's really not much missing when it comes to Hawaiian local lunch favorites over at Aloha. Its great to see that an area like Lincoln Park has opened up to Aloha Eats and it seems to be doing really well. I'm never in there when the place is empty and its really popular with groups of college kids and other young people looking for a taste of home. In case your not dying of hunger and don't feel the need for one of their huge plates, everything is available as a mini plate as well. Except the mini plates aren't too tiny either. At just a little over $5 your going to get a bunch of food and there's a chance you wont finish a small plate upon your first sitting. 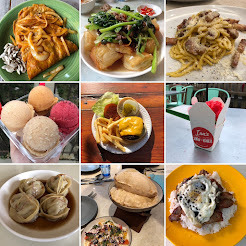 Pictured below are some of my menu favorites but there's so much more going on over there including musubi, saimin noodle soup and most dishes available with their homemade curry sauce on the side. Oh and of course they got the spam dishes. I find it real hard to go wrong with the menu. ^It was in the 19th century when John Parker brought Mexican cowboys to Hawaii to teach the Hawaiians in cattle ranching. It wasn't long before it grew rapidly and beef became a part of the Hawaiian diet. The Parker ranch in Waimea on Hawaii's big island is one of Americas largest and most historic ranches in the country. A very popular beef dish is Hawaiian BBQ beef. Its basically tender thin slices of beef marinated in teriyaki and cooked to a nice crispy but tender texture. Its great stuff with the white rice and mac salad. ^Here we have one of the many marks left on Hawaiian cuisine by other countries. Chicken katsu is Japanese fried chicken. Usually consisting of a cutlet breaded with a mixture of flour, beaten egg and panko bread crumbs its fried and then cut into bite size pieces. like everything else in Hawaii its served with rice and mac and also available with green Hawaiian curry sauce on top.It can be found in all the Hawaiian diners and fast food joints on the island and is also done with pork and duck. Hawaiian BBQ chicken: In one word "ono"
^Hawaii also happens to have a BBQ culture including the fabulous luaus with Kalua pork roasting away. They also do alot of grilling and like to grill up some BBQ chicken. Teriyaki is again a popular choice for Hawaiian barbecued chicken as well as distinctly Hawaiian bbq sauces. Pictured above is Aloha's chicken which is also available with white meat but then it wouldn't be nearly as good or as close to authentic to what they eat in America's 50th state. It ranks much, much higher than 50 when it comes to the 50 US states regional cuisines however. Get over there and give it a try and if you went to Hawaii and loved the food then Aloha is for you. Welcome to the newest ongoing series at chibbqking: "Oh yeah, I've been there to". Quick run downs of places that I also happen to have been too along the way on the great Chicago eating trail. Would I go again? Yes if I was in the hood and felt like this type of food, definitely. Alma pita is a tiny little family owned storefront that I went to over a year ago and quite enjoyed for what it was. Since I just drove by it along Wilson ave and was in the mood for something light that night I decided to give it a try. It had some regulars talking it up with the owners and it looked like a popular neighborhood spot. The menu had the usual stuff seen on a Lebanese menu and I opted for the combination plate with two types of beef including kifta kebab and one type of chicken. That came with a salad and lentil soup. Next time I'm there and there will be one, I hope to further explore the menu but will again be getting some lentil soup. It was quite tasty and quite comforting during the winter. Healthy too I assume. Service was extra friendly and prices were great. All in all it was a very good experience. Welcome to the first ever installment in the chase for Chicago's finest chili cheese dog. Its been a two month long trek to ten places that I had heard, read or was told had good chili cheese dogs in Chicago. Some places won best of lists, others were told to me by friends and some came from the internet. All I know is I will be taking an indefinite break from chili cheese dogs for the next few months. Much like Eldrick Woods I need to recognize my transgressions and realize that Chicago style minimalist hot dogs are my true love and I need to remain in a monogamous relationship with them. However every winter I have this problem that's hard to control and I just need me some chili cheese dogs with onions on top and fries on the side to feel good. Here is the list of my ten mistresses (these are all of 'em, I swear) which will be graded accordingly. Some of them have already been featured here on chibbqking and are linked up to the previous post about that place. Note: This is just my first installment. If I missed a place or you have a spot that you love for chili cheese dogs in Chicagoland then please post about it in the comments section and let us know. Good Looks. So I visited all the places listed above and scored them below. In the last two months I have tried a chili cheese dog from each one. It was my hope to find a replacement for my first chili cheese dog love from Demon Dog's (RIP). I graded the CCDs in four categories. Here is how it was setup. So as far as the hot dog went, as long as you weren't using Oscar Mayer or some other childish brand you would score a 3 or 4. Almost all these places used Vienna Beef (this is a good thing) if not all of them. However different scores were given because there are different styles of tubes from Vienna Beef (all HDs from VB are all beef) and each place used different ones. My favorite CCD from the extinct Demon Dog's used a 8 to a pound natural casing wiener. I think these are the best way to go for them. The chili used didn't need to be an award winning secret recipe from Texas but it did need to blend well with the rest of the elements. Too much beans is still a no no for a good CCD as is a soupy-runny brew. I decided I like slices of melted American cheese best for a CCD. The melted nacho cheese wasn't nearly as good and made them too sloppy when used freely. If a place used too much cheese that wasn't a good thing. There needs to be a balance. The fries were easy, if they were fresh cut and fried up nice you did well, if they were frozen you got a three if not lower. Consider a score of three to be average. Anything below is not so good and anything above was one of the better batches of fries from anywhere in the city. Now onto to the food. Its funny that I found Branko's when doing a little websearch on the city's best CCDs. Its funny because this is a place I grew up right near and I've been in there an insane amount of times since the early 90's. However my whole reason for this chase is because Demon Dog's, formerly under the Fullerton El stop, is no more. I used to go to DD's whenever I wanted a CCD and they were my favorite. So I had never had a CCD from Branko's that I can remember until I found a nomination for it from a very credible source. It turned out to be a contender from the get go. Branko's is in the Vienna Beef Hall of Fame and deservedly so. You have the option of a jumbo Vienna dog or a regular for your CCD. I went regular which is my preference. It was at Branko's I realized I like slices of melted American cheese used for CCD. Not as sloppy and works better for me. They also use a pretty good homemade chili but it all comes together really well. I've never liked the fries at Branko's but you cant complain when they come with all dogs and sandwiches. Next up was a spot who's Italian beef I love. I also had a hankering that since they use the natural casing wieners and are a first rate grease shack that maybe they did up a good CCD. Well guess what? I was right. In fact this was the closest thing I have found to Demon Dogs as far as taste. I thought it was from there. The only difference was the poppy seed bun and the fries. At Chickie's the fries are more like another long gone favorite of mine for beef and fries-Fazzio's which was at 2801 N Lincoln. The fries at Demon Dog's are your standard Chicago style fries like those found at 35th street, Gene & Jude's, Jimmy's. Chickie's scored perfect on the hot dog since they used my favorite kind, the NC 8-10 a pound from Vienna Beef. As far as the cheese goes this was also the closest thing to Demon Dogs I had. Yes it is processed nacho cheese but as you can see in the picture its a certain type. Its different then your typical baseball stadium nacho cheese which many places use. I thought the chili was good and went great with the dog and cheese. The fries at Chickie's always deserve mention when the best in city are discussed. I hadn't been to Franksville since my days of summer work with the sheriff's department. We used to go there every now and then when we were patrolling Portage Park but I don't remember anything too special about it. However I saw somewhere that they were on a best chili cheese dog in Chicago list. The people mentioned they have a good spicy chili sauce they use and included a few spots I knew about and thought were good so I decided to try. I saw Fransville's banner for induction into the Vienna Beef HOF so I know they use Vienna hot dogs. However as you can see from the photo this is a different dog than many others used. I'm not sure which type of tube this is but its not a natural casing. The chili was pretty good, actually some of the better chili topping I remember but as you can see in the pic its baseball stadium nacho cheese and they used alot of it. Nothing to say about the fries which were average. Huey's is another spot where I had seen on a best of list. I believe it was in Newcity's best of Chicago list which it was listed as having Chicago's best CCD. I had heard about this somewhat new hot dog stand here and there but never made the trek north up Clark to try the place out. Its your typical ever increasing in popularity "Gourmet Fast food" shack. Meaning to compare the places like this to your regular old dog and burger shacks is a disservice. In a city like Chicago you have to do the bare essentials really good or step it up a notch. They take hot dogs and hamburgers up another level. Nothing too fancy just attention to detail and good ingredients. They have a nice looking menu but I was there for the CCD. The first question asked when you order a CCD is if you want it charred or steamed? Well interesting because when I make CCD at home I like to grill the dogs but I also know that most places don't grill them up like I do. As you can see from HERE, I like to slit them up. I ordered mine charred and surely they didn't cut it up. Nonetheless it was still good but what was lacking in this CCD was the chili. It was rather soupy and I really didn't get much flavor from it. The cheese was nacho like but they added a good amount and the fries were home cut and pretty damn good. Lulu's got the call due to a tipper from a sheriff I know. Although it wasn't for their CCD but just as his favorite lunchtime joint. I have been to Lulu's a few times but not recently and I never had a CCD from there. However I always see the homemade chili sign when driving by and it got the call in the 1st installment in the quest for the CCD here. Its a very popular lunch spot with the UIC medical crowd and Cook County Sheriff's department and correctional officers and has been around for a while now. Well this ones on me. You don't have to get a CCD should you visit Lulu or you do but always get something else. I like the regular dogs at Lulu's just fine. Its not the city's best hot dog but if I was working near Id have one now and then. But for whatever reason the hot dog I got in my CCD was damn near decomposed. It looked like a convenience store hot dog after a 3 day crack binge. They have the signs from Vienna Beef everywhere and I'm guessing this was a VB dog but it had been around a little too long I think. Its skin was wrinklier than your Grandma Bessie's. It didn't get much better with the chili which was more like beans. I count over 15 in this picture. They did get the cheese right with it being slices of American but the fries were your average frozen brand. Mr. D's was a spot I had wanted to try a CCD from on many occasions. I'm already a big fan of this as you already know from HERE. When I was talking to a buddy from CPD at a bar one night we were talking about Mr. D's and he mentioned he always gets a cheeseburger in summer and CCD over winter. It was all I needed to give trying one a go since I had already known they make their own chili and everything is pretty much good if not great here. Its one of Chicago's best "Chicago Style fast food" joints. What does that mean? they do what they do, really good. Lots of other places have the same things but most of them don't do it like Mr. D's. Which is the right way. Mr. D's comes thru again and at this point I'm used too it. Its easy to see why this place has constant traffic and gets busy at lunchtime. The hot dog was a perfectly steamed Vienna that went great with Mr. D's homemade chili. Ok so there were a few beans in it but not too many and they also use the slices of American cheese melted down real well. You already know about the fries right? Well in case you missed it, these are some of if not the best fries in the city. Done to perfection each and every visit I've had and that's turning into quite a few. I'm betting Mr. D's does a mean chili cheese fries. Even though this turned out as one of the better CCDs, It's hard to ever pass on that shish kebab sandwich. Next stop is Pop's which has a few locations on the southside which are all very consistent. I have also been to Pop's countless amount of times and love their Italian beef. They got one of the better beefs in the city and my favorite hot peppers. I was also tipped off by a friend when talking about their IB that they also have a really good CCD and I needed to try that one day too. So it was only a matter of time before I tried one and its time came for this chase. Another useful tip from a legit source. The hot dog was just fine and your normal above average dog your going to get in Chicago. The chili was also pretty good and I had no complaints about it but also nothing that made we say WOW! More places used American slices on this chase than I thought and Pop's is included in that list. While Pop's does use frozen fries they are also my favorite frozen fries from anywhere that uses them. They are the thinner McDonald's size variety and are much like Mickey D's and they fry them up nicely at Pop's. Next up is the popular Chicago fast food place Portillo's. Its the type of place where you can see the American dream. What started out as a tiny hot dog shack on North ave in Villa Park has grown into a full blown restaurant group with Portillo's being the driver. Although they are technically a fast food place and have all the usual's like a drive thru, large menu etc...This is why there's fast food and "Chicago style fast food" Portillo's has it down to an art. It might not be the best for everything hut its perfectly acceptable and better than average with all of its menu items. Its also been my go to spot for a CCD since Demon Dog's closed. Portillo's has locations throughout Chicagoland and a couple in California. I always go to the near downtown location on Clark and parking is hard but they have a drive-thru. I knew the CCDs were good at Portillo's but I wasn't sure if they are Chicago's best. I'm still not going to say they are the very best but as I already knew they are one of the city's best. Its always been one of their most popular items right after the Chicago style dogs, Italian beef and hamburgers. The hot dogs are very nice and I think they now have their own recipe made and I think its still from Vienna. The chili at Portillo's is also one of the restaurants popular items and it works really good on a chili cheese dog. Its better on the dog than it is in a cup or bowl. They don't use melted American slices but they like Chickie's above use a decent melted brand. The fries at Portillo's while unique to the restaurant are still frozen and just ok. I always get onion rings. Tore's was the wild card in this years bunch. I never had one from here but have heard a few people ordering them when I was stopping in for a meatball or Italian beef. I haven't gotten around to it yet over at "beef with hot" but Tore's does both the beef and meatball sandwiches pretty well. They also have good hot dogs and great fries. I figured why not a good CCD? Well it wasn't one of the best but again not one of the worst. It was a middle of the pack runner. The hot dog was good but the chili had a few too many beans although it also had an alright taste and so it wasn't the worst just not the best. The cheese was nacho like and they piled both it and the chili on top. The dog fell apart about the second bite in and if I wanted to finish eating the thing it was get dirty or get nothing. Everything blended together made for an ok CCD despite the mess. I did very much enjoy mopping the leftovers that fell thru with their top notch french fries. They made for some good chili cheese fries. Another spot I've been to a few times, not too many, but never had a chili cheese dog at is Whats the. I decided to add this to the list when I saw they made their own homemade chili and knew they did a few other things well, even if Italian beef isn't one of them. Its one of those rare places where I would take a pass on the namesake menu item and order something else like a char chicken or burger or charred Polish sausage or something like that. Well they shouldn't call it "Chilly's Cheese Dog's" or anything like that either. Just like Tore's above they loaded everything onto this CCD and it became damn near impossible to pick up. The dog was good and the chili was ok but not bad for a CCD but the cheese was baseball nacho and they poured it on. The fries at WTB are some of the better fries in the city and again the fall thru chili and cheese mess made for a good batch of chili cheese fries. So there you have it folks, the first lap is over. That there is ten different chili cheese dogs from spots located around the city. Here is how Group A finished when everything was ate and done and the Rolaid's were popping. I love hash, all kinds of it. Since there are more Prime Ribs sold during the holiday season than any other time, I have been waiting to share this. As far as I'm concerned PR is the ultimate holiday meal and my favorite way to celebrate. Is there any other meal that's more fit for a King? If your doing up a prime rib then you might have some leftovers. Check out this recipe HERE I did last year with a piece of PRIME meat from Joseph's Finest Meats at 7101 W Addison. If your going to be doing it up right and spending cash on a whole prime rib this holiday season then I highly recommend going to Joseph's. It wont only be better but in most cases its also cheaper and family owned. This my friends is real deal prime meat, dry aged and full of beefy flavor. So what to do with the leftovers? Step 1) Take your leftover rib and chop it down. Make sure to trim some of the fat but save it to lube the pan. Step 2) Take your leftover mashed potatoes and add an egg to them and form them into patty's. You can also add any seasoning or whatever else you think might be good. I added bacon and chives to mine. These take 15-20 minutes maybe longer to cook. Make sure your pan is well lubed and turn them often at the beginning so they dont stick. Make sure they get an outside crust. When the pancakes are done set them on a plate and leave it in a warming oven until ready. Step 3) Chop down your onions and peppers. How much you use depends on how much meat you have left but figure 1/3 of the hash should be the pepper/onion mixture. Melt fat in fry pan and add veggie mixture into the pan and season with S&P and saute until translucent. About 7-8 minutes in add 3-4 dashes of Worcestershire sauce and mix it up and move to the side. Add the pieces of prime rib and cook for 3-4 minutes until heated thru or if you like it crispy, let it cook a while. Again, make sure your pan is hot when dropping the beef in. Step 4) Mix up your meat and veggies and drop them over the potato patty's and dash with hot sauce. Enjoy. So I decided China Chef's time was coming with the holiday season here. The Christmas holiday and Chinese restaurants have always shared a common bond together. We all remember in "A Christmas Story" when the dog eats the turkey and they spend thanksgiving dinner at the local Chinese restaurant. If your eating out on Christmas day then your going to Chinatown or your neighborhoods local Chinese joint, they're the only spots open. Its become an American tradition to do so. Although people of the Jewish faith don't celebrate Christmas they do have some traditions that go with it. What do Jewish people do on Christmas day? eat Chinese food. If your city is lucky enough to have a Chinatown then I guarantee that it will be the most hopping place this December 25th. No visit to Chinatown today though, which is the obvious place to visit for authentic Chinese regional cooking. Nope today we are going to the suburb of Morton Grove for Jewish American Suburban Chinese food. So its off to China Chef, a place that's been serving the mild tastebuds of the locals of the Morton Grove/Skokie area since 1977 with their mostly Cantonese-American-Chinese menu. At some point in time, my guess being when suburbs started forming, Chinese restaurants with an Americanized menu for the suburban eaters tastes started popping up across the country. Many spots around the city still have their vintage signs with "chop suey" all lit up and flashing. They also have the exact same menus today with all the regular dishes you would see on your local Chinese restaurants menu should you live somewhere in Suburbia. However most of these places can be very hit or miss and some are downright awful and others come and go in the same rental space on what seems like a monthly basis. The China Chef has managed to take everything loved by their neighbors and put that with excellent service and a dedication to great tasting food. Probably like that you grew up on if your from middle America somewhere. You can expect excellent takeout and delivery service along with all the regulars like the Chinese Zodiac papermat. The service is very friendly and during the weekends and Hanukkah season it can get very busy with all the parties dining in and orders being called in for pickup. Somehow they don't ever miss a beat. The owners of China Chef call their restaurants food "homestyle Chinese" and have become a part of the community in their 32 years of China Chef's existence. What exactly is homestyle Chinese? What dishes make up this cuisine? well in this case its the aforementioned Jewish American Suburban Chinese and its dishes like chop suey, egg foo young, fried rice, egg rolls, crab rangoon, sweet & sour chicken and pork, General Tso's chicken, beef & broccoli, Mongolian beef etc...You know the stuff you grew up on or lived off of in college and high school. Well over the years this spiced down and in many cases dumbed down version of Chinese food became an offspring of Chinese food and in its own right, its own cuisine. Over these years I have been to many JASC food joints and I think China Chef takes the crown for best overall in this category. Its a family run joint where its so Americanized your servers will be named "Jeff, Joe and John" (which are obviously not their real ones) and of course they have the fish tanks and fortune cookies to go with your experience. But the food is really good especially if you know what to get. They deliver, do a wonderfully sufficient pick up business and have great lunch specials. There's not much not to like about this Suburban favorite. China Chef is just another one of the gemmers I found over the years thru LTH. Since I never said I was a graduate from Princeton with a degree in writing let me quote poster Kudho who said it so perfectly...like I would like to say. I couldn't of said it any better. Its not just American-Chinese either, there's also Canadian-Chinese and if you remember my post on Negril, Caribbean-Chinese. Don't miss my upcoming monster post on where to eat Hawaiian (another Chinese fusion) in Chicago. I love it all, if its a Chinese fusion, I'm trying it and I'm loving it. Chinese cuisine made its way into other countries when immigrants moved from China across the world and cooked with local ingredients and to the tastebuds of Westerners. So as long as you don't go to a place like China Chef looking for dishes like Ma Po Dou Fu with ground pork or Xiao Long Bao, you should be just fine. Now onto the food! China Chef is also the spot for the next stop in the hunt for the "best rolls in Chicago" an ongoing chibbqking series. If you don't remember the first stop was at Orange Garden, another American-Chinese favorite around town. The places featured in this series have a reputation for excellent homemade egg rolls and are always mentioned when the "best rolls in Chicago" are discussed. China Chef is one of these places mentioned and its a spot that has very good renditions of a few of the JASC appetizer favorites. Including the egg rolls. I thought the rolls at CC were better than average to good but not quite as good as Orange Garden. I felt the peanut butter addition that I like so much was lacking in China Chef's rolls and the big downer was the hot mustard. China Chef's hot mustard would have your grandma saying "that's not hot". The one problem I have with this place is even the dishes listed as hot are anything but spicy. You really have to let them know that you like it hot like they do if you have a high heat tolerance. The dude (stevez) who put me on this place over at LTH says they are his favorite and that he thinks "they put just a tiny hint of curry in with the peanut butter when they make the egg rolls. That's what puts them over the top for me." I cant disagree with the fact they are very good and I always order one to start. As long as you know what to order when visiting, at pretty much any Chinese restaurant, you can have a great meal. Here are some of the China Chef's loyal patrons favorites eats. If there was ever a type of food to eat with groups of people, Chinese is it. Try and go here with a bunch of people and this way you can have it all. ^I have a distinct memory of when I was younger and we were at a Chinese restaurant before a Bulls game or something with my dad, uncles and grandpa and I wanted Pot Stickers. So my grandpa asked me what I was ordering and I said "two orders of potstickers" and he said "ya I know were ordering that for the table but what do you want for a main course" I said "potstickers" he thought I was crazy. My dad tried to make me order something else for the table but hey, I'm hard headed and I loved potstickers and I still do. The China Chef version is as good as I can remember. Crisp, light skin with good flavor inside made great with the vinegar sauce they serve with it. ^Too many places screw up fried rice which is pretty hard to do. Not at china chef where they fry up huge piles of pork fried rice with the perfect color, phenomenal flavor and crispy pieces of pork. I could eat fried rice 4-5 days a week if its cooked correctly and China Chef does it up just right. Again, one of my favorite variations of an American-Chinese favorite. ^S&S chicken is a dish I rarely order when eating out American-Chinese. Half of the time its not fried (which is how I prefer it) and the other half of the time the sauce is not to my liking. Its not the flavor of S&S sauce I don't like but the gooiness of it. Usually its too sweet and has too much cornstarch. Not so at CC. I'll also usually get chicken if ordering this but thanks to a tip I always get pork here. If I can quote Cathy2 from LTH she tipped off that..."China Chef's sweet and sour pork is the best version I have ever had. The pork has a very light coating almost tempura-like with a light fruity sauce not weighed down too heavily in cornstarch." Guess what? I totally agree. This was my favorite pork version, Chicken Lavish still has the best chicken version I can remember. ^I think that of all the main entrees on the American-Chinese menu that General Tso's chicken is the most consistent. I usually find good versions of this dish that has no origins back to China or General Tso and was first mentioned on record in 1977 in the NY Times. Its pretty hard to screw up the deep frying of dark pieces of chicken, which is then tossed in a sweet and sour sauce with a bunch of common American-Chinese ingredients. I do wish CC's version was hotter but I already knew that they don't respect my heat level. Other than that it is great. ^Now here is one of my favorite dishes in Chinese food. Unlike the rest of these we've seen, this dish actually has traces back to China. So I guess because of this, China Chef doesn't excel in this dish. I would have to say take a pass on the Kung Pao at CC but this is my personal preference. I didn't like the chicken at all, thought it was too stringy. Kung Pao chicken is one of my favorites because when good its full of flavor but the taste and heat was lacking at China Chef. ^I always have to have an order of the house special Mongolian beef when dining at China Chef. Like most American-Chinese dishes it has no traces to China and the name is misleading. It has nothing to do with Mongolia as far as ingredients and preparation. However they do a great version of this JASC classic. Grandma, Grandpa, the kids, me, you, everyone likes this dish. On top of all these favorites China Chef also has a Filipino menu and from what I've heard from reading around, its not all that bad. You better believe that they will be open and packed on Christmas day this upcoming holiday. Listen to a story about the Chinese food-Christmas day connection aired on NPR by clicking HERE.